Here are a few ideas from Officeworks co-founder and qualified Osteopath Tim Hanwell on proactively improving your workstation setup to increase wellbeing and boost productivity. 1. 62% workers eat their lunch al-desko! At Officeworks we see the benefits of moving around and leaving your desk at lunchtime which include breaking up a long day of sitting, a change in posture, fresh air and giving your eyes a rest from staring at a screen. 2. Are you holding your mouse correctly? Did you know that different mice or input devices should be used depending on the task? For example data input, typing long emails or scrolling up and down a screen require different devices. There are also different sized mice depending on the size of your hand. The position of the mouse on your desk is also very important. 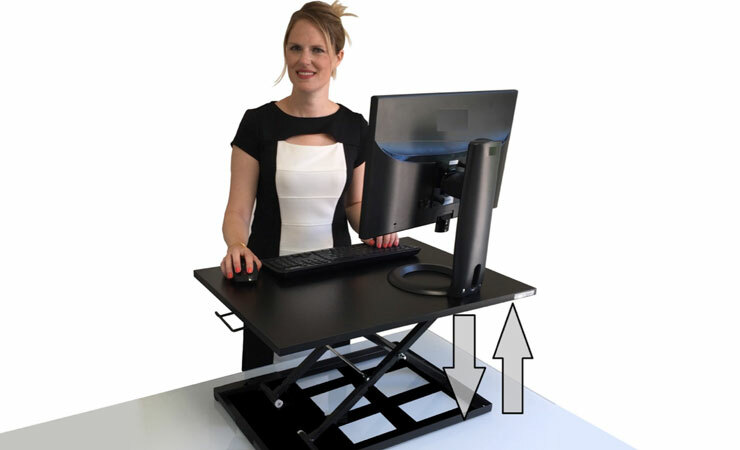 We understand that the ‘ergonomic fit’ between you and your workstation is important. If you borrowed a friend’s car you would know how to adjust the mirrors, seat etc. The set up of your workstation is equally important and shouldn’t be ignored. We are big advocates of the sit-stand desks designed to keep you fit, healthy and more productive while at work. Is your office space restricting your productivity? We believe that whatever the size offices should be fully functional spaces which promote good health in employees. Find out from our two-hour Expert Walkthrough how your key workspace environmental factors: noise, heat, light, furniture and space are performing followed up with our recommendations in a written report.